Sometime during the next few decades, if trends continue, the neighboring Indian states of West Bengal and Bihar could see their fortunes reversed. Bengal, the most industrially advanced state at the time of Independence in 1947, has seen its position weaken during 30-plus years of communist rule. Meanwhile, Bihar, one of the Bimaru states (including Bihar, Madhya Pradesh, Rajasthan, Uttar Pradesh) is a rising economic star. The Bimaru acronym has been appropriate all these years: In Hindi, bimar means “sick.” But there was much jubilation in Patna, Bihar’s capital, when the state announced an 11% GDP growth for 2009, second only to progressive Gujarat. “Between 2004-2005 and 2008-2009, [GDP] grew at an average rate of 11% per annum,” says Dharmakirti Joshi, director and principal economist at CRISIL, a Standard & Poor’s company. While Patna cheered, Kolkata (formerly Calcutta) — the capital of West Bengal — mourned. What had millions in tears on the city’s streets was the January 17 death of Jyoti Basu, the state’s 95-year-old former chief minister and leader of the Communist Party of India (Marxist), or CPIM. Indeed, Bihar has received some good press lately. An International Finance Commission (IFC) report titled, “Doing Business in India 2009,” has given Patna a number-two rank in the category of starting a business. (New Delhi is number one.) “Business start-up is least expensive in Patna,” according to the IFC report. Bihar has also taken several initiatives on the social development front. It has won the Manthan award for e-governance for its Jaankari program, a project in the right-to-information arena. Bengal, meanwhile, is drawing more brickbats than laurels, for problems ranging from trade union issues to government policies that critics say have stifled industrial growth. Bihar’s new dynamism has two sorts of skeptics. First are those who doubt the numbers. “The estimates of GSDP [gross state domestic product] are always prepared by the state governments, not only for Bihar but for other states as well,” says Shaibal Gupta, economist and member secretary of the Patna-based Asian Development Research Institute (ADRI). “The Central Statistical Organization [CSO] makes comparable estimates of the states based on this data. It has been found that there is an error of 3% to 7% between the estimates prepared by the states and final estimates prepared by the CSO.” Data are used selectively. For instance, while Kumar is promoting the high Patna rank under “Starting a Business” in the IFC study, Rajesh Chakrabarti, assistant professor of finance at the Hyderabad-based Indian School of Business (ISB), points out that the city’s overall rank in “Doing Business” is actually 14. For the record, Kolkata is last of the 17 Indian cities studied. Wharton management professor Saikat Chaudhuri says he is “happy to see how Nitish Kumar has unlocked the potential” of Bihar, which “should have been one of the richest states” because of its large amounts of fertile land and industrial development. (Some of those industries have since gone to the new state of Jharkhand that was carved out of Bihar.) However, he agrees that Bihar is starting “from a very, very low base,” and that its growth should be viewed in perspective. “It’s a wonderful example of how good governance and responsible, accountable leadership can make a difference, even in Bihar,” says Wharton management professor Jitendra Singh. However, assuming the numbers are correct, he adds that “GDP growth is not the be-all and end-all of economic development” and wonders “if the quality of life is improving or declining.” Another factor likely to affect Bihar’s prospects, he notes, is the stigma of corruption and political cronyism that Bihar has carried over the years. The problem with Bengal “is not that people today oppose industrialization, but [they oppose] the manner in which it was done,” according to Chaudhuri, who points out that force was used in land acquisition from farmers for the projects. “In a state where people have not seen new industrialization [and there are] many closed factories, and people are conservative and risk averse by nature, the mindset of farmers sitting on fertile land is going to be, ‘I can feed my family off it,'” he says. While crediting former chief minister Basu for land reforms that led to small holdings and “an incredible revolution in agricultural output,” Chaudhuri says those reforms backfired when the government decided to take back some of those land holdings for the Singur and Nandigram projects. According to Chaudhuri, Singur and Nandigram are setbacks “more in terms of delaying progress as opposed to derailing it and plunging the state into stagnation once again.” He argues that Bengal has inherent competitive advantages, such as its strategic location on the Far East-West corridor, cheaper land and lower costs of living compared to many other states, and a collection of elite educational institutions. Significantly, both the ruling CPIM party and its rival, the Trinamool Congress led by Mamata Banerjee, are in favor of industrialization, except that each approaches it in the context of its respective political base, he adds. For example, the CPIM’s top leadership was willing to embrace industrialization, but it had to then sell that idea to its party cadres, and then to its political base and the middle class, he explains. Against that backdrop, the Nano project in Singur “may have been a little early,” says Chaudhuri, pointing out that “it is difficult to change mindsets overnight.” Over the last 10 years, Bengal’s chief minister and Jyoti Basu’s successor, Buddhadeb Bhattacharjee, had “reversed course” from an unfriendly business policy to one that brought forward momentum, “and Singur was to have been the catalyst” to push the state towards a 10% growth rate,” he notes. But that attempt at showcasing the state’s growth opportunity was aborted by a confluence of forced land acquisition and political opportunism, as he sees it. Going forward, Chaudhuri believes a two-phase growth agenda would be beneficial for Bengal. In the first phase, between now and the next state elections 18 months away, he does not recommend “an iconic project” like that of Tata in Singur, but action on five relatively smaller fronts: (a) steel plants proposed by the Jindal group and a few others, (b) the Rs. 10,000 crore (US$2.5 billion) Durgapur Aerotropolis project that combines an airport and a business park, and is backed by Singapore’s Changi Airports International, (c) the proposed Panargarh Industrial Park in Burdwan district that includes a steel plant project, (d) a proposed petrochemical hub in the Haldia district and (e) continued growth of the IT sector, boosted by investments of major players like Wipro Technologies and Infosys Technologies. “If these go through, they will demonstrate not just the potential but [that] it can be implemented on the ground,” says Chaudhuri, adding that “these showcases” can be used to trigger the next phase of investing in Bengal. All the same, Bengal has ideological baggage to rid itself of, according to Wharton’s Singh. He feels the state may not be able to catch up with other, more progressive states “after years of wrong-headed thinking.” While Bhattacharjee’s efforts at industrialization are impressive, “the real work has to be carried out by a succession of leaders,” and it cannot be done overnight. “Eventually all economic activity sits in a societal context, with its set of values and psychology,” he says. Gupta of ADRI feels that Bengal’s problems had taken root earlier; the Left just helped them along. “Bengal started sliding back on the industrial front immediately after Independence,” he says. According to Bhandari, Bengal has gone from being one of the more successful states in India in the 1960s to “just below average” in 2008, lagging Haryana, Maharashtra and Gujarat. Bengal’s per capita gross domestic state product of US$637 in 2007-2008 ranked 18th in the country — “not a rank one can be inordinately proud of,” he adds. Still, many believe that the big triumphs — or perceived triumphs — of the left in the past are coming back to haunt the government and the party. The biggest achievement in West Bengal has been land reforms. The left came to power in 1977. In 1978, it launched Operation Barga. Under this, sharecroppers (bargadars) were effectively made owners of the land they tilled. Small and marginal farmers own 84% of the total agricultural land in Bengal today, compared with the 43% average in the rest of India. This created a huge vote bank that has kept the left in power, but it has also created problems. During the time of the reforms, land holdings were adequate for one family — but that is not necessarily the case today, when several sons might need to share the original holdings. Another challenge that Bengal has faced is the fallout from the partition that presaged Independence. As a result of the partition, the state lost a lot of its jute-growing areas to East Pakistan (now Bangladesh). It also had to cope with three million refugees. Bengal’s state government has also shot itself in the foot on several occasions. For instance, in 1983, it abolished the teaching of English in primary schools in the government education system. This was to create a level playing field for underprivileged and rural children. It ended as a disaster in a globalized era. In the process, the state missed out on the rise of the IT and BPO industries, where knowledge of English has given the country an edge over China. Much damage occurred over time. 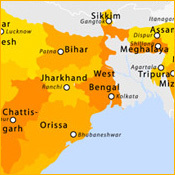 According to a 2009 report by the Associated Chambers of Commerce and Industry (Assocham): “West Bengal occupied prime position at 4th place as a favorable investment destination in calendar 2007. However, it witnessed a major shift to 13th position in the current financial year (2008-09).” In calendar 2008, expression of interest to invest in West Bengal by India Inc dropped 63% over calendar 2007. “The effects of the economic slowdown, the credit crunch along with the Singur saga spelled troubles for the region,” adds Assocham. Basu was Bengal’s chief minister for 23 continuous years, an international record. Nitish Kumar, Bihar’s chief minister, has just completed four years in office. Meanwhile, anyone comparing the two might well wonder whether West Bengal will recover, and whether Bihar’s renaissance will be a brief wonder.